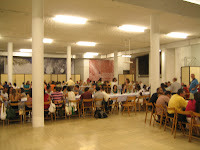 On Wednesday night the parishioners of San Giovanni al Porto held a dinner for about 100 international guests, rather like the one we provided for the CL group from WYD, only larger. I think I was probably one of the oldest guests there. 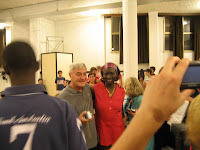 Early in the night we had a visit from Vicky Aryenyo, the Ugandan woman I mentioned a few posts ago. This enabled me to get my first decent photo of her. It's been impossible up to now, because she is always surrounded by a mob that would do a rock star proud. Josh and I were the only Australians there, which was a bit inconvenient because each country had to perform up on stage! Easy if you're a big group of Brazilians with plenty of rythm, not so easy when there are two of you. Josh piked completely, so I provided (fortified by a glass of the local wine) a slightly unorthodox rendition of Waltzing Matilda without accompaniment. This seemed to do the job, and Australia's honour was saved. On the way home, the organiser (a formidable woman called Valeria who is involved in politics here) told us a bit about the town. The Left has been in power locally ever since the war. According to her, in Rimini you're either in CL or in the Communist party. It wouldn't surprise me to find plenty people in both. There is no street named after Saint Anthony of Padua here, despite his historical connection with the city. Valeria and her friends are trying to get the local authorities to fix this. Her Italian friend (husband?) in the car cracked a joke about renaming the Piazza Gramsci after Anthony. Gramsci is a famous Italian Communist, and all of the Italians in the car thought this enormously funny. I discovered a couple of days ago that the first Rimini Meeting (1979?) was an initiative of the local CL community. I asked Valeria how big the community was when that happened, and she answered "very small". Food for thought. Wait wait...go back. Did you sing Waltzing matilda? Is that what you're implying?